Documents from the Kivelidi case refute the official version of the Kremlin that the Novichok nerve agent had not been developed in Russia and does not exist, Novaya Gazeta writes in its issue from Friday, March 23, 2018. A substance with similar properties had been used in the 1990s for the murder of banker Ivan Kivelidi. The court case contains testimonies from one of the chemists who developed Novichok at a secret institute. He has taken out hundreds of lethal doses of the toxin that have fallen into the hands of criminal groups. This chemist is Leonid Rink, who gave an interview to the Russian state agency RIA Novosti a few days ago. After the publication of the interview, Rink’s words had been changed so as not to contradict the official version that Novichok does not exist at all, Novaya reports. In the original version, he claims that Novichok was not a single substance but an entire chemical weapon system used by the USSR and called Novichok-5, and that the name Novichok has always been followed by a number. The redacted version only says that it was absurd to talk about a Novichok formula and a project with such a name. But in protocols of Rink’s interrogation in the Kivelidi case, carried out in the period 2000-2006, the chemist reveals shocking details about the nerve agent, which had been known only to a narrow circle of experts. Leonid Rink has been Head of the GITOS Division – State Institute of Organic Synthesis Technology, a Soviet chemicals weapons research facility in the town of Shikhany in the Russian Saratov Region. Within the framework of the investigation into the death of Kivelidi and his secretary, the Saratov FSB (Federal Security Service) had provided information that in 1994 GITOS had illegally synthesized and disseminated a toxic substance. This had directed investigators to Rink. He confessed to them to having secretly been sneaking the nerve agent from the institute and to having sold several vials of it to different people. Rink had been aware that the toxic substance would be used against humans. The interrogation had also included a court expert, another chemist who had confirmed that the substance used for the killing of Kivelidi and the secret substance from GITOS produced until 1994 were identical. “It has no analogues in the world, its properties are not described in the scientific literature, including in classified publications, and its formula defined in the Expert Conclusions refers to nerve agents,” says the expert. There are three expert findings in possession of Novaya Gazeta: by the Criminal Expert Center of the Ministry of Interior of Russia, the Institute of Ecology at the Russian Academy of Sciences and the GOSNIIOHT Institute, part of which is GITOS. The all have found the same formula. The newspaper also provides the findings of chemist Vil Mirzayanov, a participant in the development of chemical weapons in Russia, now living in the United States. According to him, the expert formula refers to the group of substances under the name “Novichok”. Former Russian spy Sergei Skripal and his daughter were recently poisoned in the United Kingdom with a similar substance, and their symptoms coincide with the symptoms of the victims of the Kivelidi case, recalls Novaya Gazeta. Rink’s motive to sneak the secret toxin out of the institute turned out to be personal gain. For a miniature vial of Novichok, which he had handed over to the buyers hidden in a pen, he had received USD 1,500-1,800. The vial contained enough toxin to kill hundreds of people. One of these vials had been bought by gangster Artur Talanov for self-defense. Subsequently, Talanov was injured during an attempt to rob an armored truck on the Latvian-Estonian border and he is now disabled. From him, the substance had ended in the hands of Vladimir Khutsishvili, accused of killing Kivelidi. The prosecution had proven in court that Khutsishvili had been in the banker’s office and had dropped a tiny dose of the nerve agent into the screw on the telephone handset on Kivelidi’s desk. In total, chemist Leonid Rink had managed to take out eight or nine vials with the lethal substance. He had kept them in his garage before handing them over to people from the underworld. 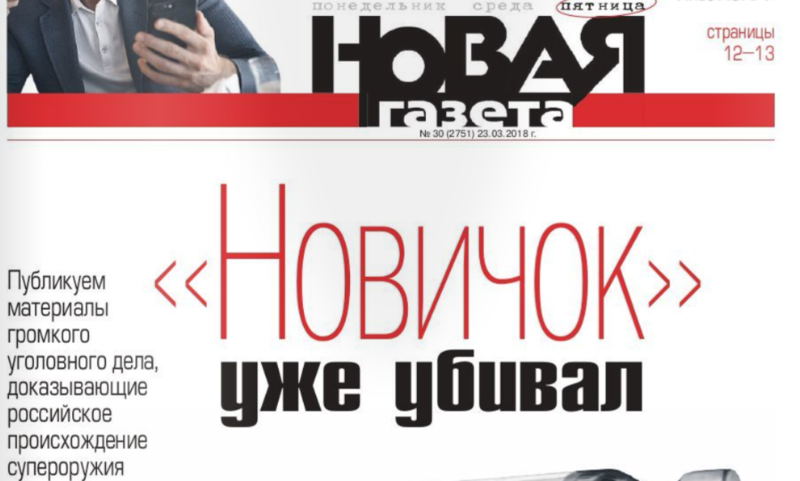 A separate and classified as “top secret” case had been launched against him, Novaya Gazeta writes. In 1995, Rink had been also able to sell Novichok to people of Chechen nationality, it is written in documents from the investigation. In the end, however, the cases against him and those who had bought the secret toxin had been terminated in 1999 and 2004 due to the expiration of the statute of limitations.